We are only a week or so past 30 June (a common balance date for many Hedgebook clients) and already we are fielding questions/comments regarding the big movements in the mark-to-market valuations of our clients’ portfolios. The questions have nothing to do with the accuracy of the valuations but mostly around, “why has this happened?” Many of the big movements relate to our clients that hedge their interest rate risk via interest rate swaps. 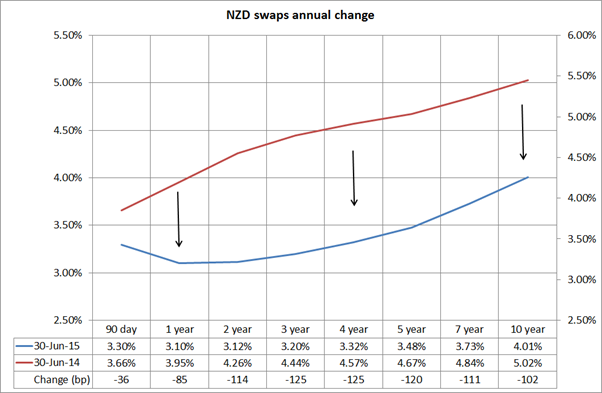 It is no surprise given the sharp downward movements we have seen in the New Zealand and Australian yield curves over the last few months (see charts). 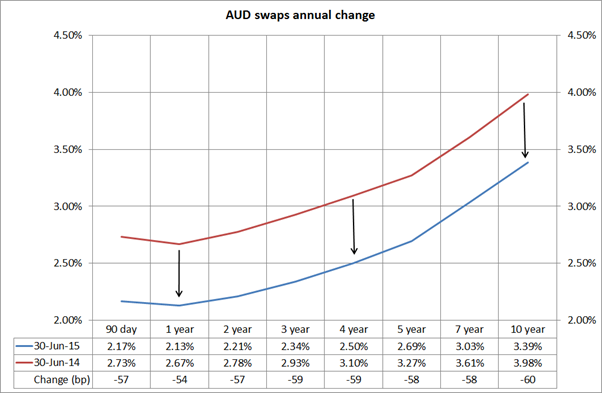 A 1% move on a 5 year $5 million swap will result in a $250,000 move in the mark-to-market. 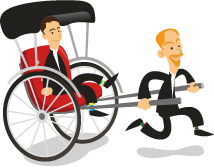 Depending on the size of your swap portfolio, and the tenor of the swaps, the moves can be material. An interest rate swap is a valuable hedging tool which helps companies manage their interest rate risk. Many companies have treasury policies which force them to have a proportion of fixed and floating interest rate risk which helps with certainty of interest cost as well as smoothing sharp interest rate movements, both up and down. However, there is also a requirement to mark-to-market swaps, and for many to post these changes to their profit and loss account. Some companies negate this profit and loss volatility by hedge accounting, but many don’t which often requires some explanation to senior management, directors and investors. For publicly listed companies the impact, both real and perceived, of large movements in financial instrument valuations is even more critical. The requirement for continuous disclosure means that a large move in these valuations may require the issue of a profit warning, as we have recently seen from Team Talk, the telecommunications company. Team Talk’s shares dropped 6.3% on the back of the hit taken by a revaluation of interest rate swaps. The company noted that the change in the value of the interest rate swap portfolio was due to “wholesale interest rates falling significantly in the period”. Equally we have a number of private companies and local governments who have been concerned at the change in their valuations and how they are going to be explained further up the tree. Having constant visibility over these changes will at least forearm any difficult conversations, as opposed to relying on the bank’s month end valuations. Whilst Hedgebook won’t help improve mark-to-market valuations, it does assist with companies keeping abreast of changes in the value of swap portfolios on any given day. This is pretty much a “must have” for publicly listed companies that have the responsibility of continuous disclosure but forewarned is forearmed and many others are also seeing the benefit of having access to mark-to-market valuations at any time.